Sangria is a wonderful summer beverage. It is made of an inexpensive red wine, lots of fruit, a bit of brandy, triple sec and lime juice. Before we get into the recipes though, here is a bit of information on Sangria. 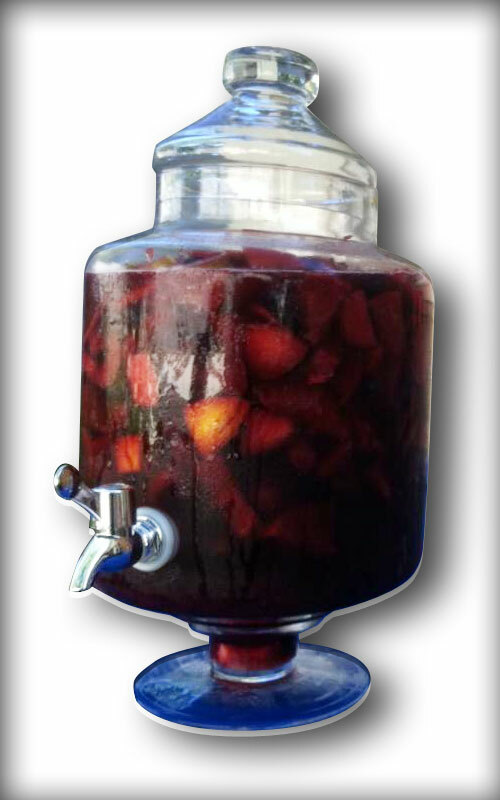 The name Sangria comes from the Spanish word for “blood” – sangre – because it is typically made from a dark red wine. It is a “wine punch” from Spain, Portugal and Argentina. However, some of the best Sangria that I have tasted was in Italy. It usually is made from wine, chopped fruit, and a small amount of brandy and triple sec. The fruit includes lots of citrus – orange, lemon and lime – as well as apple, peach, melon, strawberries, blueberries, grapes, cherries, pineapple, kiwi and mango. It is served throughout Spain, Portugal and Italy during the summer months and in other countries all year-round, including Cuba, Peru, Mexico, Puerto Rico, Chile and Argentina. Usually poured from one-liter pitchers, it is often served with a wooden spoon that is used to get the fruit out of the bottom of the pitcher. I, however, make it in large containers with spouts and use a ladle to get the fruit into the glasses. Cut up the fruit and pour the wine, brandy, triple sec and limeade into a container. 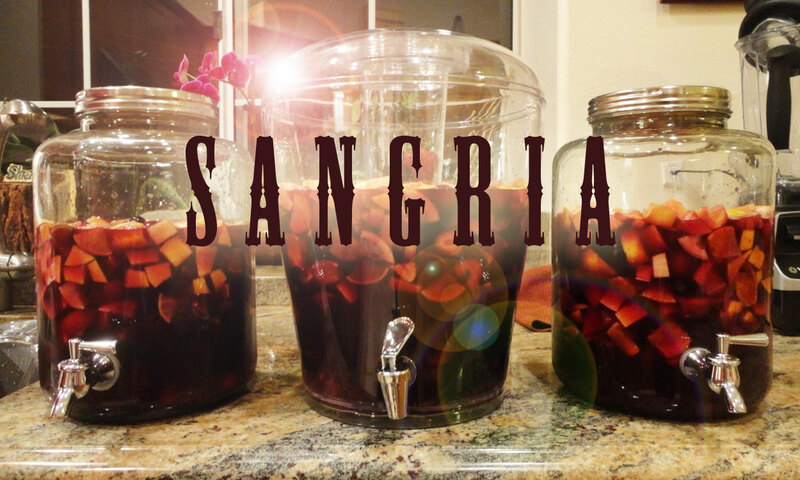 Because Sangria is so good, I would suggest doubling the recipe. Let this sit for a minimum of one day. I like to let it sit for two days. Add sparkling water to the mixture right before you serve it. I usually figure on about a half liter per bottle of wine. If you want the Sangria a little sweeter, use ginger ale or Seven-Up. Add ice cubes and enjoy!! 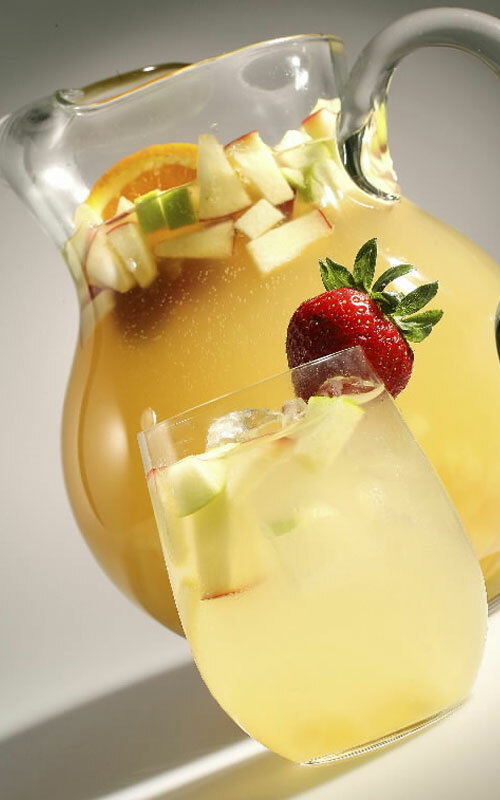 As a variation of this, I recently came up with my own White Sangria (Sangria Blanca) recipe. Prepare the fruit as described above. Add the limeade, brandy and triple sec and let that mixture sit for a minimum of one day. Be sure to mix it up so that the fruit is evenly soaking in the liquid. Add a bottle (or two) of Sparkling Wine right before you serve it. I use Prosecco, but any Sparkling Wine will work. I would suggest not spending a lot of money on the wine as it is getting mixed with the other parts. But stay away from the real inexpensive American Sparkling Wines that traditionally give people headaches because of the carbonation process. (That’s a whole other discussion at a later time.) Add ice cubes – this is a refreshing and tasty treat. I love Sangria. It is a refreshing party beverage that always delivers. I would suggest playing around with the recipe and spinning your own mix on this if you feel adventurous. Or follow the above recipes and know that you will be quite pleased with the result. But if you do add your own spin, be sure to let us know how it comes out!! Salud! Need more recipes? Check out our wine cocktails & recipes list! Thanks Scott!! And it’s fun to come up with new recipes for Sangria!! Nothing like an annual sangria soiree!!!! Funny, I was just thinking about bringing some Sangria to a party on the 4th. Good timing. Thanks for the recipe. Have a fun and safe 4th of July my friend!